Welcome to the Burton School Association page. 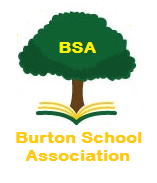 The BSA is run by the parents, carers and teaching staff of the children at Burton Primary School. We aim to organise and run events that are not only fun, but enhance our children's educational experience. We raise precious money to provide the things our children want and need that don't necessarily fall under government funding. The BSA need members on the committee to exist; but really anyone who is a parent, grandparent or childminder of a child that attends Burton School, is automatically a member of the BSA. We have a dedicated team around us who work incredibly hard to support the children and school. If you feel you could help in any way we would love to hear from you!